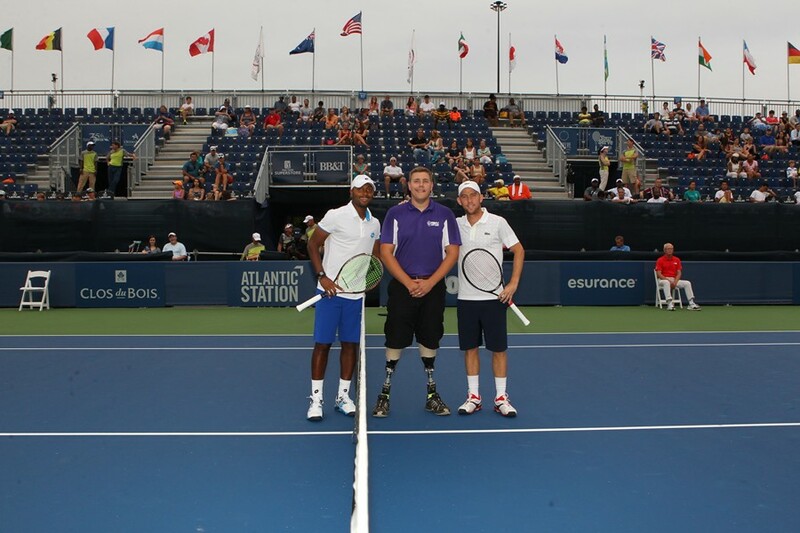 The BB&T Atlanta Open celebrated its first day of main draw matches by honoring those who serve our country with Opening Ceremonies & Military Appreciation Night. The evening was filled with memorable moments for all involved, as service members and veterans were commemorated throughout the event. Thorlos, a padded sock company and tournament partner, was on site all day to give away pairs of its product in exchange for $5 donations to Purple Heart Homes. Dale Beatty, an Iraq veteran and CNN “Hometown Hero,” founded Purple Heart Homes. The organization helps find and create homes for disabled veterans. Beatty was on hand to watch some tennis, talk about his experiences and raise awareness for his organization, which is expanding its services to the Atlanta area. While in Iraq, Beatty, a fan of the Thorlos product, which is based in his hometown, developed a relationship with the company and even had them send socks overseas. After he returned home to undertake his next endeavor, Purple Heart Homes, Thorlos was more than happy to continue to help its hometown hero. During Military Appreciation Night, as the sun began to set, the Ft. Benning Rock Army Band kicked off the evening’s festivities as it tore through a high-energy set of classic rock hits. The rock band is a four-member subset of Ft. Benning’s 44-member Maneuver Center of Excellence Band, with a specialization in blues and rock from the ’70s, ’80s and ’90s. The opening ceremony then began with the presentation of colors by the Georgia State Defense Force 1st Brigade Color Guard. The presentation was followed by a powerful rendition of the National Anthem, sung by recording artist Elle Graham, complete with a fireworks finale. The ceremony then concluded with an honorary coin toss by Beatty, who enjoyed the entire night’s activities.